Axlewood (Anogeissus latifolia (Roxb. ex DC.) Wall. ex Bedd.) is a small to medium-sized tree up to 20-36 m tall, with a straight and cylindrical bole up to 80-100 cm in diameter. Its wide leaves (that give it the name latifolia) are opposite or sub-opposite, simple with grayish-yellow or whitish hairs below. The fruit is a 2-winged pseudo-achene, packed into a dense head with a single seed (Orwa et al., 2009). Anogeissus latifolia is native to India, Myanmar, Nepal and Sri Lanka, and found throughout tropical Asia. A tree of tropical and subtropical climates, it is found in deciduous or semi-evergreen forests. It is a common element in teak forests but also occurs in the understorey of dipterocarp forests, in bamboo forests. It is also present in vegetation under semi-arid conditions such as savanna woodland and dry rocky hills. It is usually associated with Albizia lebbeck, Dalbergia spp., Grewia tiliaefolia, Albizia amara, Gyrocarpus jacquini and Mesua ferrea (Orwa et al., 2009; Singh, 1982). In India, it grows in most parts of the country except in arid areas and moist areas of North-West India (Singh, 1982). Anogeissus latifolia grows up to an altitude of 1200 m, with an average annual temperature of 38-45°C and an average rainfall of 625-2250 mm. It is found on a variety of soil types but prefers deep alluvial soils. It does not tolerate waterlogging (Orwa et al., 2009; Singh, 1982). 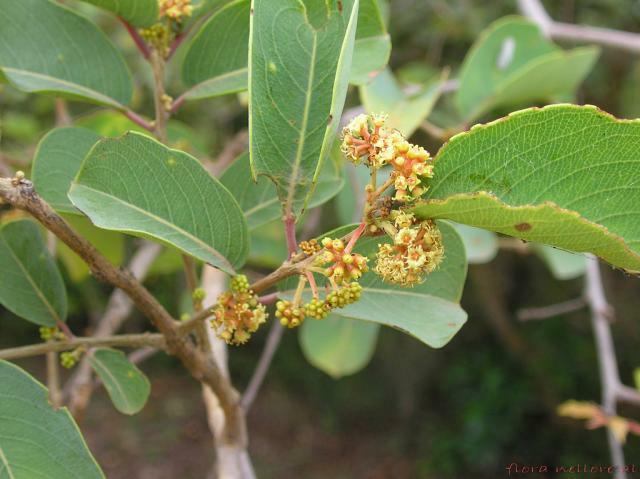 In India, Anogeissus latifolia is leafless from February to May, flowers from June to September depending on locality, and mature fruits are present from December to March. Leaf flushing begins in the dry season, peaking before the onset of rains (Orwa et al., 2009). The protein content of Anogeissus latifolia leaves is in the 7-12% DM range (Sen, 1938; Bakshi et al., 2011; Singh et al., 1998). In India season did not have any significant impact on the protein and ash content of the leaves, but the NDF, ADF and lignin were the lowest in summer and the highest in winter (Bakshi et al., 2011). The leaves are rich in tannins (Bakshi et al., 2011). There are few reports concerning the use of Anogeissus latifolia as fodder. The leaves are browsed by cattle and other ruminants. Organic matter digestibility of dry leaves was 60% in goats with a DM intake of 2.58% of live weight (Chanda et al., 1988). Degradability of Anogeissus latifolia leaves was higher than for other local Indian tree species and the rumen fill value was the lowest (particularly in summer), suggesting that the leaves are a good potential source of nutrients for ruminants and suitable for use as supplements (Chanda et al., 1988; Singh et al., 1998). The flowers of Anogeissus latifolia are an important pollen source for bees. Tussar silkworms (Antheraea mylitta and Antheraea proylei) are fed on its foliage (Orwa et al., 2009).